XIE Shan anad Miyagawa are my choice for 2 of the best satsumas. The Louisiana Early, Early St. Anne, Brown Select are also very good. Several of the China varieties are also good. I didn't see Xie Shan on the website so I called Ruth and she said it must be a mistake and she will add it back into the system this afternoon. Thanks for the notice, Millet. I've had xie shan on my wish list for 2 years!! Unfortunately, I can't find it anywhere in Arizona! Do xie shan satsuma grow true to seed? If so, maybe I could plant some since i can't import any citrus into AZ. I'm not sure what you are getting at here, Millet. Does Brite Leaf also carry Xie Shan? Do xie shan's grow true from seed? I agree that exemptions should be given Millet. So if i were to grow a Xie-Shan from seed, what rootstock should I transfer it to and how long would I have to grow the original seeds before transferring? 3-5 year is not bad at all!!!! Excellent news! Obtaining seeds should be much easier than getting a tree in AZ. Besides, growing seeds is very entertaining to me. A Mexican Lime I grew from seed 2 years ago just gave me the 1st lime. Just cleft grafted xie shan onto a branch of my owari satsuma about 8 weeks ago. The bud stick is green and the union has healed but the buds on the graft have not grown. I notched about an inch up from the graft to see if that would force it but nothing yet. There are active growing branches above this graft with fruit so I wonder if that is inhibiting the buds from breaking out. Harris finally updated their inventory and I ordered a Xie Shan. I'll post a picture when it arrives. Xie Shan arrived today. There were some delays because Harris only seems to have biweekly USDA inspections that are required for their shipments. The tree looks very healthy and arrived undamaged. I was originally planning on getting two but I am starting to worry that I am expanding my collection too quickly... I need to be sure I can care for everything efficiently over the winter. I wanted to drag this topic up to offer and ask for Xie Shan growers comments on how it has done for them. I have been growing Xie Shan since 2012. It has proven to be extremely cold hardy enduring lows of 18 several times,with minimal damage and no cold protection. All four trees have developed into a large mounding tree about 10 feet tall and slightly wider. It sets large loads of fruit however the fruit is puffy, insipid and unsaleable. Yesterday February 27th, 2018 I attended the Florida Panhandle Satsuma Workshop given by IFAS and the University of Florida. Not many growers are growing Xie Shan and those that are says it takes 8 - 10 years to mature and produce quality fruit. Many have bull dozed their plantings and replaced them with other varieties. So I'm asking yall what has been your experiences? As a point of reference my four were bought from Harris and I couldn't be happier with them. I really would like to have a Xie Shan but can't find trees being sold anywhere. Has anyone seen them in stock at all online? I wrote to Harris, who replied that they will have some in the future. Guess I have to be patient. I'd also be curious to hear how they are growing for everyone. Seems like I've heard multiple folks say it's one of the tastiest citrus they have had. But 8-10 years is a long time to get the fruit quality up. Not sure I'm THAT patient. Those who love them, how old are your trees? I've been pleased with the 3 gallon xie shans I purchased last year. Many are almost 5ft tall now and took 18 degrees as well as almost 2 weeks of sub freezing nights . As to fruit quality , I am.uncertain but I am hopeful. Could puffy fruit be because of too much nitrogen? Too much N has been suggested but I don't believe I did that. To explain, my citrus rows have a Geneva Double Curtain muscadine trellis running the length of the rows between the citrus rows. I fertilize each according to recommendations. I'm careful to fertilize within the dripline and careful about not overlapping. Having said that as far as I know muscadine nor citrus roots probably don't care about driplines. Maybe I do need to cut back. Overwatering has also been suggested. Mother Nature doesn't read the suggested watering guides for my orchard plants. She gave me 91.3 inches last year clearly more than I needed. I'll start with the soil sample and see what I have in the ground and go from there. was on a 25+ year old owari tree planted in 1989 grown in sandy soil. I took buds from those trees and grew my own and got lousy, puffy, fruit for 5+ years. "Too much N has been suggested but I don't believe I did that." I doubt that as well. Fertilize with Nitrogen according to tree age and crop load. 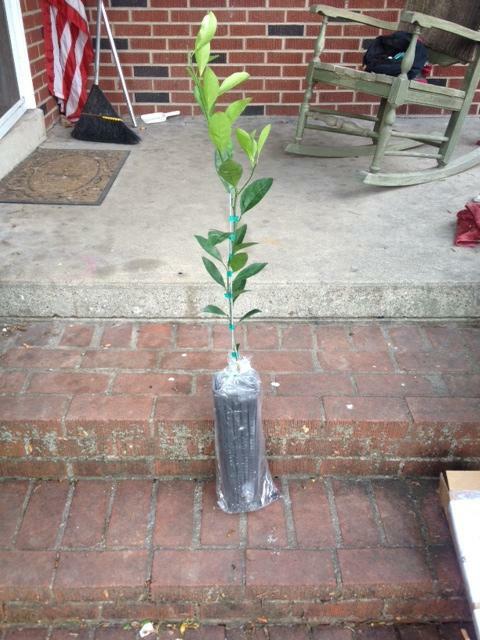 Protect foliage from winter damage to avoid leaf drop. Prevent injury to foliage by Red Mites,etc. Water trees diligently from budbreak through early fruit drop. Citrus are evergreen plants & relatively heavy nutrient consumers. Nitrogen is main element of concern. Slow-release may be effective in some sites. Soil & Leaf testing identifies need of other elements. In years with poor April Bloom or poor May fruit retention, skip applications 2 & 3. Use granular fertilizer (no spikes). Broadcast under tree canopy. Water in with sprinklers or rainfall. 20% mothers day, 20% fathers day.